Before we talk about thyroid cancer, let we see what is thyroid it self. The thyroid is a butterfly-shaped gland located on the anterior aspect (front) of the neck, just above your collarbone. It has two kinds of cells that make hormones. A healthy thyroid is a little larger than a quarter. If the thyroid became swollen (Goiters), it is may caused by not enough iodine in the diet. You should go to the doctor if you have a lump or swelling in your neck, especially if these condition growth slowly month by month or event years. May be it is a mass of abnormally growing cells (Tumors Thyroid). Tumors can be either benign (cells from benign nodules do not spread to other parts of the body) or malignant (called cancer when these tumor cells gain the propensity to invade tissues and spread locally as well as to distant parts of the body). Received radiation treatments on the head or neck. The exact cause of thyroid cancer is not known, But there are some Predisposing factors include ; Radiation therapy and the effects of nuclear exposure, family history of thyroid cancer, prolonged thyroid stimulating hormone exposure, and chronic goiter. And Difficulty swallowing or breathing. These symptoms are not sure signs of thyroid cancer disease, because on some people with infection thyroid or another problem also could cause these symptoms. Doctor may use your information like medical history, signs and symptoms to diagnose most thyroid cancers. They will do physical exam (palpation of your thyroid to feel for enlargement and lumps) and also several tests to learn the size and location of a thyroid nodule or to help determine if a lump is benign, meaning not cancerous, or malignant, meaning cancerous. Diagnosis test for Thyroid Cancer are blood tests, and imaging (Chest x-ray, Ultrasound, Computed tomography/CT scan, and Magnetic resonance imaging/MRI) and biopsies to diagnose thyroid cancer (studying tissue samples under a microscope). Blood tests cannot diagnose thyroid cancer disease, However, tests of blood levels of thyroid-stimulating hormone (TSH) may be used to check the overall activity of your thyroid gland for for hypothyroidism or hyperthyroidism. Patients with very advanced thyroid cancer may develop any of the following complications such as Pleural effusion, Pericardial effusion, Spinal cord compression, Bone metastasis, High Calcium level and Pain. Remember! Despite treatment, thyroid cancer can return if microscopic cancer cells spread beyond the thyroid before the thyroid removed. Patients who has diagnosed as Thyroid Cancer, they will get treatment option depend on these category ; Age of the patient, Type of thyroid cancer, tage of the cancer, General condition, Is there any multiple endocrine neoplasia type 2B (MEN 2B), new case or return cancer. Most people with thyroid cancer undergo surgery to remove all or most of the thyroid. 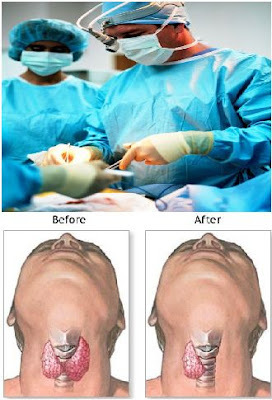 Lobectomy is surgery procedure where the medical team will remove only the affected side of the thyroid gland, this action mostly consider to the patient with thyroid cancer stadium/stage I.
Thyroidectomy is surgery procedure that removing all or total microscopic examination of nearby lymph nodes. But in most cases, the surgeon leaves small rims of thyroid tissue around the parathyroid glands to reduce the risk of parathyroid damage. This treatment used on thyroid cancer stadium/stage II - IV. After thyroid cancer surgery done, the doctor will give you medication as thyroid hormone : levothyroxine (Levothroid, Synthroid, others) for life. They will suggest you to check your thyroid hormone levels every few months, in order to finds correct or proper dosage of your medicine. The doctor gave me lortab long time after suffering from back pain, I did not take importance to this icon in order to feel pain, until no stamina, after many doctor visits and many tests I found chronic fibromyalgia, and after evaluating and conduct a comprehensive review told me that the most appropriate to ease the pain were Lortab, Vicodin or Oxycodone, but I asked my doctor to prescribe me the most effective and less addictive and prescribed Lortab, have already taken this medication 2 years and though it causes some kind of anxiety I control myself properly, I have no problems so addictive, I think if they know their anxiety is effective restraint, this is good because these narcotics findrxonline indicate that opioids can be very dangerous. Thyroid cancer is somewhat related to thyroid goiter. The symptoms of the disease is somewhat a like and the solutions are also related to each other. Appreciate this wonderful and useful article you have shared.